Type 2 diabetes is a condition that more and more people are fighting, and the fight against type 2 diabetes requires daily diligence. People who are diagnosed with this health problem are generally expected to consume a healthy diet and to work towards establishing some sort of exercise routine that works for them and their fitness levels. Type 2 diabetes can be controlled if the proper steps are taken, and for many patients one of those steps involves taking medication that is designed to help them regulate their glucose levels. One medication that has been used widely since it was introduced to the American market in 2005 is known as Byetta. 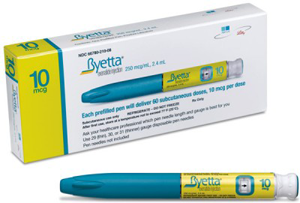 Byetta is a medication that is specifically used by people with type 2 diabetes to help control their glucose levels, and that provided a substantial amount of revenue for the original manufacturers of the drug, Eli Lilly and Co. and Amylin Pharmaceuticals. Byetta works by mimicking a synthetic hormone known as GLP-1. This mimicking function helps increase the body’s sensitivity to insulin. People with type 2 diabetes are unable to make use of insulin in the same way as those who do not suffer from this condition. Obviously, each of these alleged Byetta side effects are extremely serious and could put people’s lives in danger if they are allowed to develop without early and aggressive medical intervention. Since the results of this study were released, the FDA took a closer look at Byetta and it published some warnings regarding the potential risks regarding these alleged Byetta side effects. Recently, the FDA has once again announced that it will be reviewing statistics and other forms of data regarding patients who were using Byetta and who had developed the serious side effects that were mentioned above. No word was given as to when this analysis would be complete nor was any indication provided as to what action, if any, the FDA would take based on those findings. What is known at this point is that people who have used Byetta to help control the symptoms of type 2 diabetes have suffered, and some have suffered immeasurably. People who have been diagnosed with a serious health problem that could be related to the use of this medication need to take immediate action on several fronts in order to protect themselves. Obviously, people in this position need to do whatever is medically necessary to fight through these problems. They should also have their situations thoroughly reviewed by Byetta side effects lawyers who can help them decide whether or not they may have a valid legal claim to pursue. If you are one of these people, contact Parilman & Associates today to schedule a free initial consultation.